Is There Anything in Islam for This Ex-Muslim? While you may have given up Islam, are there any trappings of Islam you still practice? For example, do you fast during the month of Ramadan? I get asked variations of this question all the time, and the answer for me, personally, is no. Nothing I did beacuse of my religious beliefs was anything that continues to be worth it to me for me to continue doing as an atheist. In fact, some of the mandates of Islam are legitimately harmful. A while back, I wrote a piece on Medium about my early experiences as an out ex-Muslim online called An Apostate of Towelie: Being the Only Woman in the Ex-Muslim Chatroom. An edited version of it appeared in Atheist Alliance of America’s magazine, Secular Nation. I have built a fledgling (perhaps fetal, if I’m being generous) writing career around it. I promote and am a part of organizations about it. I openly talk about it and identify with it. I am an ex-Muslim atheist, loud and proud, unashamed and out, and have been since 2006. And yet, despite my shamelessness, I mentally buried a significant part of my early history with being an apostate of Islam. The very first time I joined a group for apostates of Islam, I defected after just two group chat sessions. Indeed, the memory might have stayed buried indefinitely were it not for a particular troll who found my writing at Skepchick. 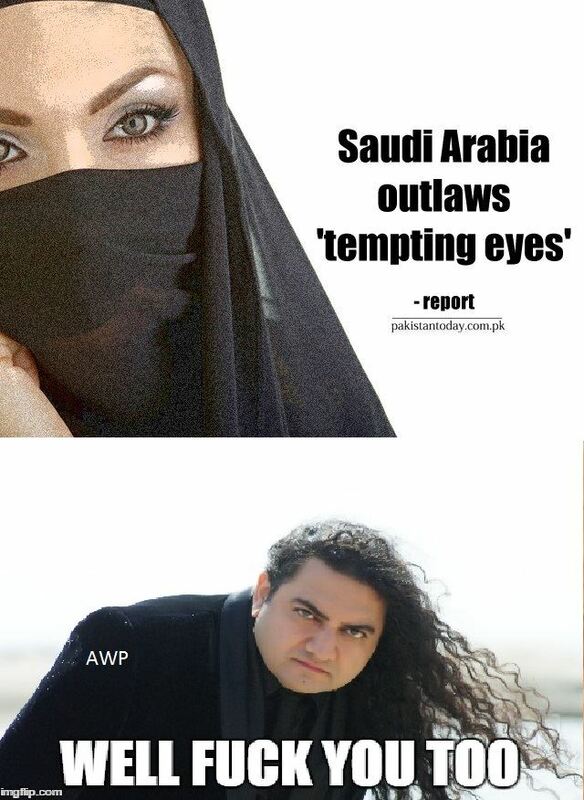 The guy at the bottom is Taher Shah, who has made his love of eyes very well-known. Although it’s not the most racially diverse secular group (for obvious reasons), one of the reasons why I am so happy and proud to be part of EXMNA is its internal diversity of experiences and viewpoints. Our secret discussion group is full of thoughtful people who enjoy conversing on matters ranging from a bizarre Saudi eye ban that would presumably make Taher Shah very angry to Tajikistan’s religious laws to Junaid Jamshed’s misogyny (and beard). Two members of the org recently did an interview on Dr. Darrel Ray’s Secular Sexuality podcast [Content Notice for Abuse] that’s very much worth a listen. Their experiences are quite disparate from mine in that both of them face a lot of physical danger from their families. Embeds of both the podcast and my Skepticon talk below the jump. Once upon a time, I had just come out to my family as an ex-Muslim. Believing me to be under the influence of a a heathenish social group or malicious atheist man, my folks dragged me to mosque after mosque all over California. The miles were clocked in the hopes that some imam or sheikh would manage to “answer my questions” (though I was long past questions, really). I went along with it, since I had been successfully gaslit into feeling guilt for my choices and had learned that there were rewards to giving into their “requests” instead of resisting them (i.e. I’d be left blissfully alone about it for a longer while if I yielded instead of standing my ground). One such excursion was up north to see a religious leader my father knew and liked. That my cousin’s Gaye Holud was to take place that evening was no deterrent. The entire family piled into the van and we made the 150-mile trek up to the Santa Barbara area. What ensued was an hours-long conversation that involved lots of discussion and point-counterpoint but absolutely no eye contact between the imam and me, bless his devout heart. Once upon a time, my writing knew I was going to end up an atheist before I did. Back in fall of 2005, I was the kind of girl who would have ended up on Patheos Islam, not Freethought Blogs. At the time, I wrote a piece for the Muslim Student Union at UCI’s now-defunct magazine, Alkalima. It apparently is quite popular and has been reposted and even reprinted (without permission, from what I can tell) all over the Internet. The irony is that, by the time it was published in April 2006, I was a closeted atheist, an outcome that a careful look at the article itself could have predicted. In some cases, when I happen upon a Facebook friend’s share of one of my posts, I wish I hadn’t found it. In other cases, I end up wishing that people still commented on actual posts rather than limited their criticisms to comments on their friends’ shares of links. For the record, I do read all the comments and am a fan of feedback. Aslan seems so dedicated to fighting anti-Muslim bigotry that he underplays the effects of Muslim bigotry and presents the Muslim community as a whole as far more progressive than it actually is. He took issue with my use of the word “community”, and he is right to do so. However, there is an issue that I only realized was at play when I considered why I had said “community” in the first place: I was thinking in translation. In conversations regarding the lack of representation of ex-Muslim voices, I’ve come across a lot of people willing to guess at and speak for ex-Muslims. When I ask that they let the actual ex-Muslim in the conversation (i.e. me) speak, I’m told that I don’t represent all ex-Muslims. Well, yes. But frankly, at least I’m not a never-Muslim speaking completely out of my arse. #AnApostatesExperience: Why Do They Always Forget to Ask Ex-Muslims? Something that we at EXMNA have been hard at work trying to rectify is our relative invisibility. People on all sides of the issue of apostasy in Islam have a tendency to forget that we exist. Numerous podcasts, articles, features, books, and so on mention us, sometimes even use us as props in arguments, without any of us actually being consulted on the matter. That it often stems from ignorance of our existence rather than malice makes it no less insulting and dehumanizing. How bad is it? When I try to bring awareness of the issue, I’m told that ex-Muslims face too many dangers to be out, so there is no way to contact “them.” I’ve had anti-feminists tell me that if I really cared about women’s rights, I’d know and care about the plight of “those” ex-Muslim women. I’d laugh if it weren’t such a painful reminder that my mere existence isn’t worth consideration in so many people’s minds. Thankfully, there are some who remember us. Yet those who do know we exist sometimes still rely on second- and third-hand voices to speak for us, even on matters that are explicitly by, for, and about us. This erasure must be stopped. To quote fellow Patheos blogger Dan Arel, #AnApostatesExperience was meant to show “what real threatening and venomous attacks look like,” as if that erased the threats that Aslan received. It’s hard for me to see how this is any different than “Dear Muslima,” except this time it’s a Muslim as the target. [Aslan] never suggested that his experiences are worse than the experiences of any ex-Muslims, so what do they have to do with the threats he’s received? The struggle of ex-Muslims is an important issue to highlight, but not as a way of one-upping the victims of threats and harassment. To answer the title, i.e. “Why is it so hard for critics to read Reza Aslan charitably?”: It’s because Aslan is far too charitable when it comes to the oppression that Muslims perpetuate within their own communities. Further, I find the characterization of #AnApostatesExperience in the post to be not only uncharitable, but also poorly-informed as to the real issues with Reza Aslan and with ex-Muslims.